Wow! These pictures illustrate the WOW factor of this condo off of Highland Road in Baton Rouge. This property would be perfect for the Southdowns investor (a neighborhood in Baton Rouge, LA). Call me to schedule your tour of this beautiful condo!!! or to create your own personalized MLS search in the Metro Baton Rouge Market. Visit www.callChristopher.com or call me at 225-938-8229. WHAT A VALUE!…in a convenient location under $100,000. The pictures tell it all but let’s mention the UPDATES to this ground floor unit. *** New Roof 2-3 months old. Newly replaced A/C outside and inside one year ago. Newly installed hardy plank on back of unit around rebuilt fireplace. New appliances. ***Enter the front door to find this completely renovated condo with beautiful concrete stained floor, granite tile snack bar/counter tops and stainless appliances. Enjoy your rebuilt wood burning fireplace that has been framed by a reclaimed New Orleans wood mantle. 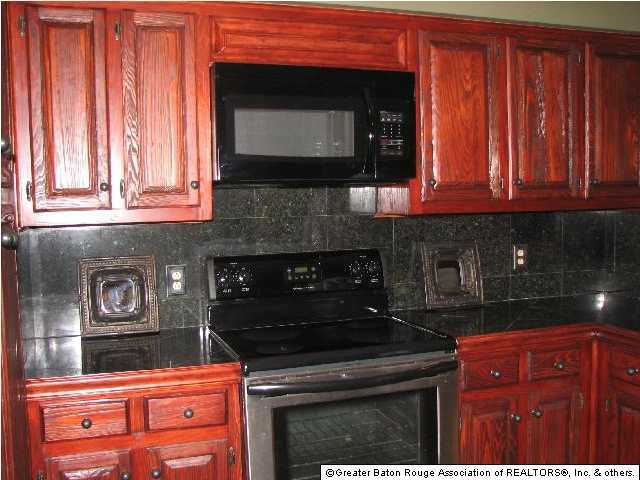 Enjoy cooking in your kitchen that features stainless appliances, New microwave vent, Newly refinished cherry stained cabinets and slate floors. Off the main hallway enter the first bedroom which could double as a home office. The guest bath features tile countertops and travertine flooring as does the large master bath. The master bedroom is large with its own walk-in closet. Step out onto your covered patio/porch (unique to this unit) with access from the living room and master bedroom. The patio area is private with a full wooden fence…great for entertaining or pets. Also enjoy additional shade from the oversized cypress tree off the back patio. And with two car covered reserved parking this condo is perfect for YOU! Call and schedule your appointment TODAY! !